Combine orange juice and grated peel. Heat over low heat. Add marshmallows and stir until dissolved over low heat. Cool. Add sugar to whipped cream. Fold into orange mixture. Chill. 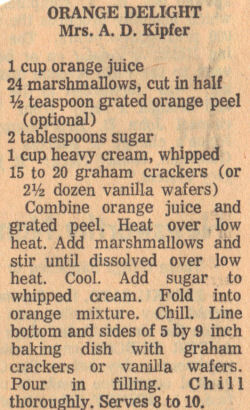 Line bottom and sides of 5 by 9 inch baking dish with graham crackers or vanilla wafers. Pour in filling. Chill thoroughly. Serves 8 to 10.